I have been teaching yoga since 1979 and in Aurora Ontario, since 1993. As well as being the mother of 3 children, (including one who is now a certified yoga teacher), I teach classical yoga as taught by Baba Hari Dass. My initial teachers’ training began with Marie Paulyn at the School of Hatha and Raja Yoga in 1978. Marie was the first female yoga teacher in Toronto. I am recognized by the Yoga Alliance as an experienced yoga teacher at the 500 hour level – ‘E-RYT’. I had to prove I had taught 5000 hours before 2002. As of 2014, I decided not to pay into the Yoga Alliance anymore. Major Influences in my life have been; Yogananda Paramahansa, Baba Hari Dass a silent master yogi from Northern India (Babaji) was my yoga teacher since 1979, Nisargadatta Maharaj, Sri Aurobindo, The Mother, Mother Meera, Eckhart Tolle and Adyashanti and his wife Mukti. Adyashanti is now the teacher that ends all teachers for me. His teachings have had a huge impact in my life. Inside this heart here, there is the deepest Gratitude to all the teachers who embody endless loving attention for all our humanness. In 1997 I wrote and produced 2 yoga series for television! One was a simple asana show and the other was a 13 show series; “Traditions of Yoga Yesterday and Today.” The first and only show of its kind! It was a magazine style show about all aspects of yoga such as book reviews, interviews, asanas, health benefits, sutras etc. It turned into the final course to complete a Degree in Fine Arts. 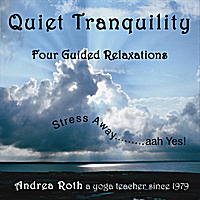 In 1997 I also released a guided Relaxation CD called “Quiet Tranquility.” It is available on iTunes. I have a Bachelor Degree of Fine Arts, Specialized Honours in Music from York University and have been a Reiki Master (teacher) since 1998. I also enjoy photographing flowers. I love collecting herbs/flowers and turning them into organic fresh creams, Muscle and Joint Heaven, teas, lip balm, and tinctures. Occasionally a clown comes out in my classes. I started to practice qigong in 2010. My first teachers’ training was with Master teacher Daisy Lee in Radiant Lotus Qiqong for women in 2011. I studied for 9 days with Qigong Master Li Jun Feng in Sheng Zhen Qiqong which translates as Qiqong of Unconditional Love. I also did teacher’s training with with Daisy Lee and Francesco Gariopolli in Qiqong for Cleansing & Detox in 2011. I have been a member of the National Qigong Association. I continue to train in various forms of Qigong and love to share them with my students. In the Fall of 2013 I took the training to be a Death Doula(death midwife), home funeral guide and green burial educator with Jerrigrace Lyons down in California through her Final Passages program. In 2015 I completed a certificate through Centennial College called Thanatology; Death Studies – A Practical Approach. For me, looking at my fears and attitudes towards death directly, is very profound and helps me LIVE more fully, with a ‘fresh and more accepting attitude’.